A young boy dealing with his mother's dwindling health begins having encounters with a giant monster who promises him help. 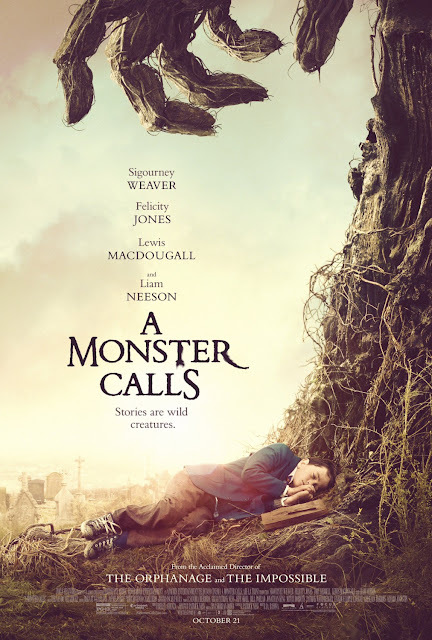 "A Monster Calls" is directed by J.A. Bayona, who is known for his films "The Orphanage" and "The Impossible." It is based on a novel of the same name by Patrick Ness, who also penned the screenplay for the movie. This is a film about a young boy named Conor, played by Lewis MacDougall, whose mum, played by Felicity Jones, is dying from cancer. He is not a popular kid and doesn't have any school friends. His dad, played by Toby Kebbell, lives in America with his new family far away from Conor and his mum. One could say Conor's only true friend is his mother. Unable to cope and wanting to save his mom, a giant tree monster, voiced by Liam Neeson, appears to Conor, promising to help. This monster will do so by telling three stories, but at the end of those stories, the monster wants Conor to tell him a tale in return, the fourth story, which is his reoccurring nightmare. This is a beautiful, heartfelt film that offers an interesting approach to coping, illness, and grief. It uses a fantastical allegory to help explain the difficulty of having a parent suffering from a terminal illness. Though this is a movie that can be watched by and is likely targeted for children to a point, it never talks down to its audience and approaches this tough subject with a lot of truth and raw honesty. It respects that children can deal with what are perceived to be grown-up subjects in a thoughtful way. This is a heart-wrenching film that completely wrecked us. We cried, hard and often, throughout the course of the movie. We, unfortunately, can't help but draw parallels from our own lives to this picture, and it explains how BigJ and I have felt in the past when we were losing someone, how we felt angry and scared and upset and selfish all at once. This is a movie meant to be seen by people who have lost someone, and it explains grief and sickness with gargantuan amounts of accuracy, but you don't necessarily need to personally relate to understand its powerful premise. The way "A Monster Calls" takes the audience on a roller coaster of emotion through the stages of anguish and heartbreak, it may make you feel drained as the credits roll, but for those, like us, who know all too well the painful sting of loss, it may also be cathartic. Lewis MacDougall offers a powerful performance as a newcomer to film. He has to display a wide range emotions and does so with magnificent success. The adult performers are excellent as well. Liam Neeson does a wonderful job bringing life to the monster of this story. Felicity Jones is also good as a mother wasting away, but having to say goodbye to her son. Toby Kebbell even gets his chance to shine as a father who has left his past behind in favor of something new. Please, please go see this pleasant surprise of a movie that turned out to be one of the best of 2016. It is a shame that "A Monster Calls" will not do better in the States. 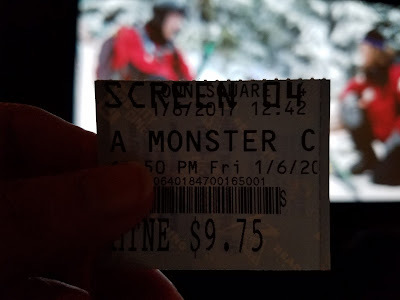 We fear potential audience goers will either make snap judgments before even seeing it because it has a giant tree monster and many will assume it's a kids movie, or that they will assume since it deals with death that it's too mature for children. We implore you, don't judge it like this. This film absolutely deserves to be seen on the big screen, whether you're intimately familiar with a subject like this or not. A stunning, tremendously powerful, fantastical film full of brilliant, lively drawings, great acting, and a heart-breaker ending.